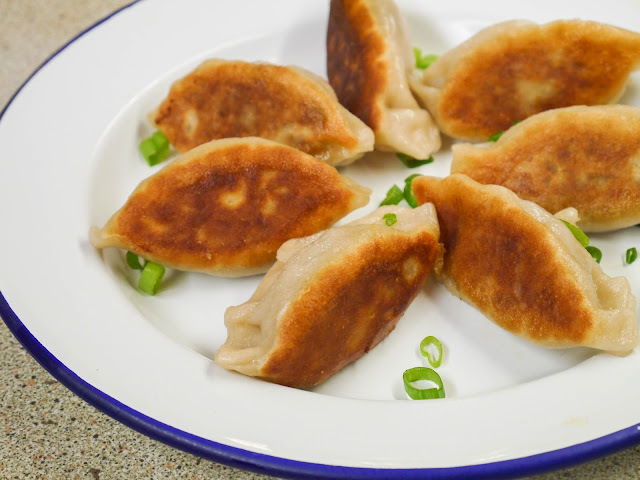 This recipe is for Chinese Chicken Potsticker Dumplings. It's something that I had wanted to try for ages and finally got a chance a few weeks ago. 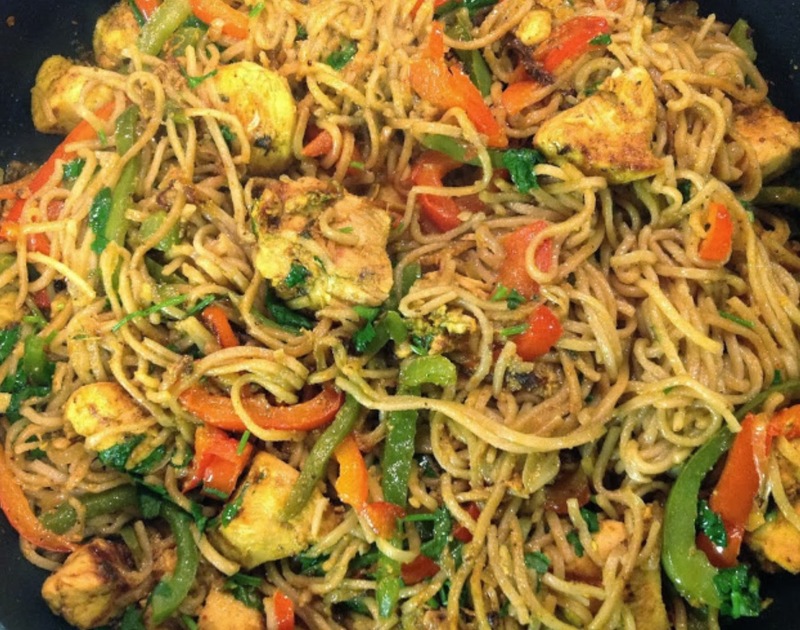 Where I live, halal Chinese food isn't readily available and so I have to make do with making my own which usually involves a lot of recipe adjustments to suit the Muslim diet. 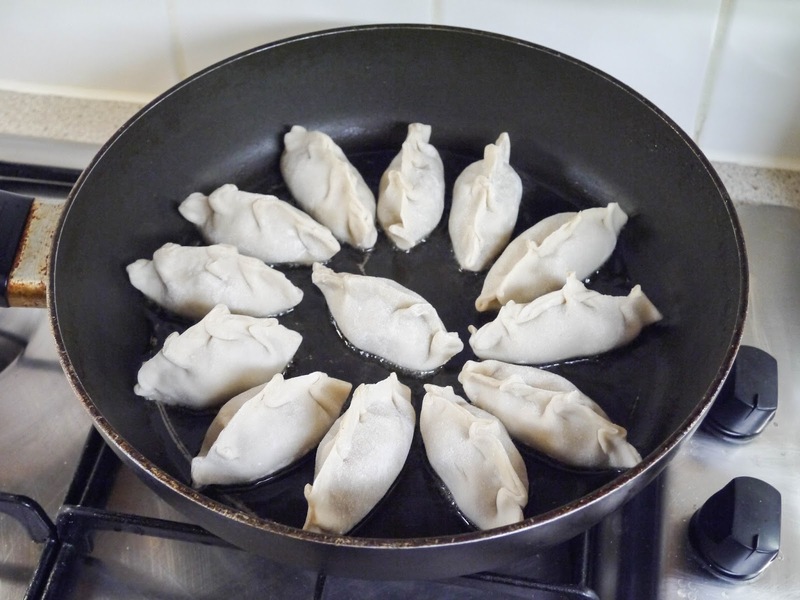 Every culture has their own version of a dumpling, and being a Pakistani, I am well versed in the art of making our kind of dumpling, the Samosa! There are many different varieties of Chinese dumplings, but I decided to try the Potsticker, and I am definitely hooked - these will definitely be made for our Ramadan spread this year, Insha Allah. First, to make the dough. 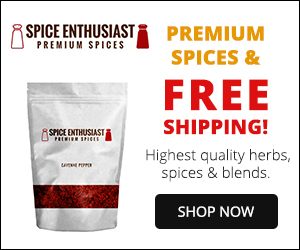 Place 10.5 ounces (300 grams) of Plain Flour into a large bowl. 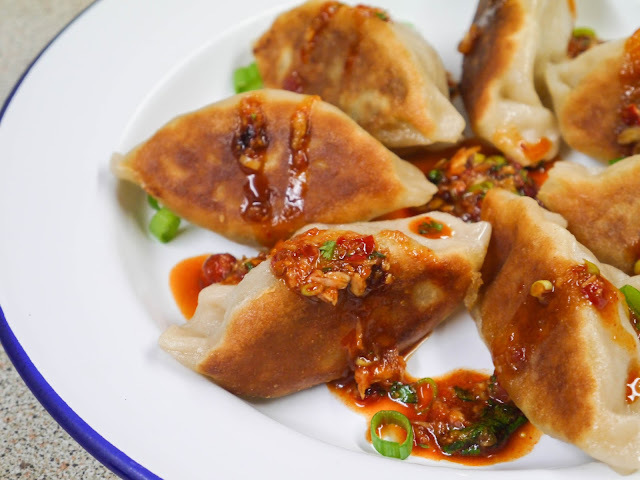 If you want to buy the dumpling wrappers online, you can find some here. Add 220ml of Boiling Water. Mix the dough until it becomes a rough ball. Tip it out onto a lightly floured surface. And, knead for 10 minutes until smooth. You can do this in a machine too. 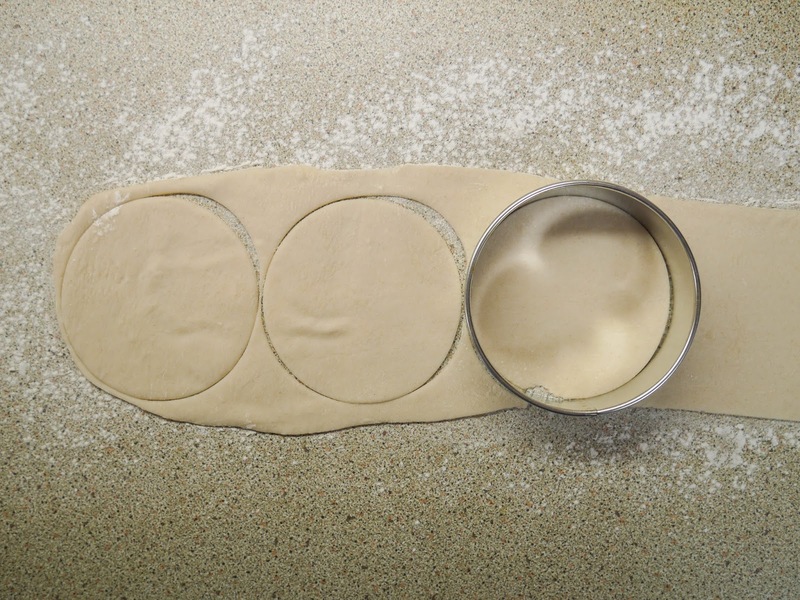 Cut the dough into 2 equal sized pieces. Use your thumb to make a hole in the middle of each piece. Stretch out to a bagel sized shape with an even thickness all around. Cover with clingfilm, and leave to rest for 20 minutes. Add 1 pound of Chicken Mince. 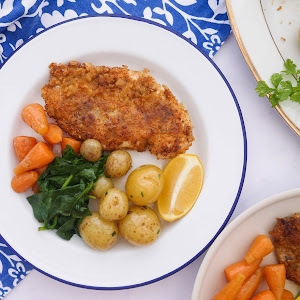 Try to get chicken mince that has been made with chicken thighs. This will result in a juicy filling. Important Note: This filling will go into the dumplings raw, and will be cooked when the dumplings are fried and then steamed. If you prefer, you can cook the mixture now too - just make sure to cool before filling. 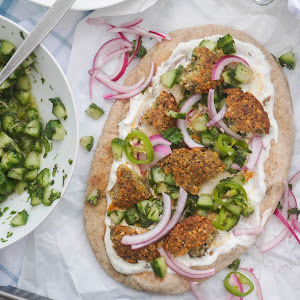 I tried both methods - using both raw and cooked fillings, and they both turned out good. Once the dough has rested ..
.. slice each ring in half. And, cut into 16 equal pieces. Take a piece of dough and flatten with your palm. Roll into a thin circle which should be 8cm in diameter. Note: I have also tried putting this dough through a pasta machine. It worked really well and took out all the hassle of rolling by hand. 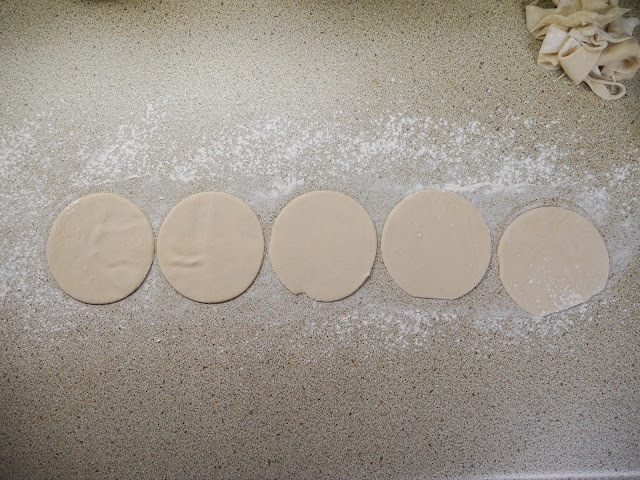 Just divide the whole dough into 4 pieces and pass through the machine - I went up to number 4 in mine. Then, place on a counter and use a large round cutter to cut out rounds. Brush the edges with a little water. Place a heaped teaspoon full of the mixture in the middle. 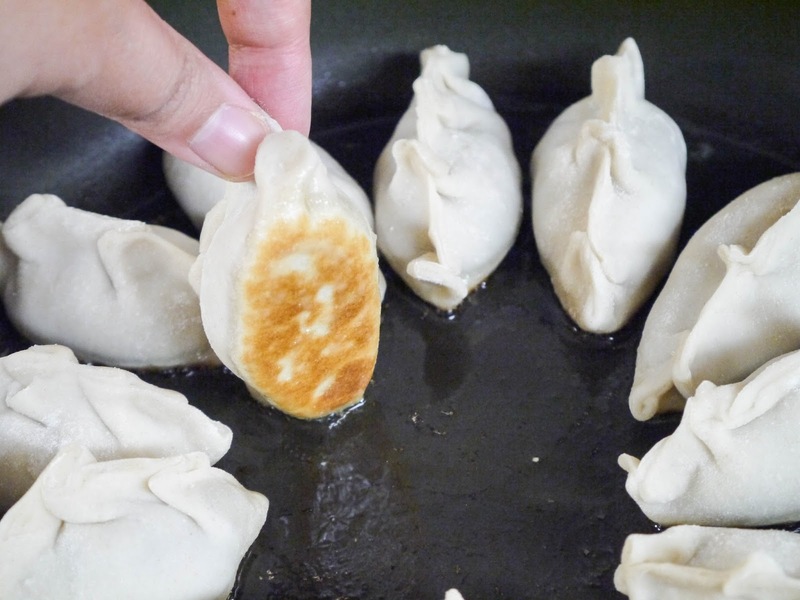 Fold over in to a half-moon shape. Press the edges down. Crimp the edges in the style of the potsticker dumpling. Continue making the rest. Pretty soon, you'll have a production line on the go. 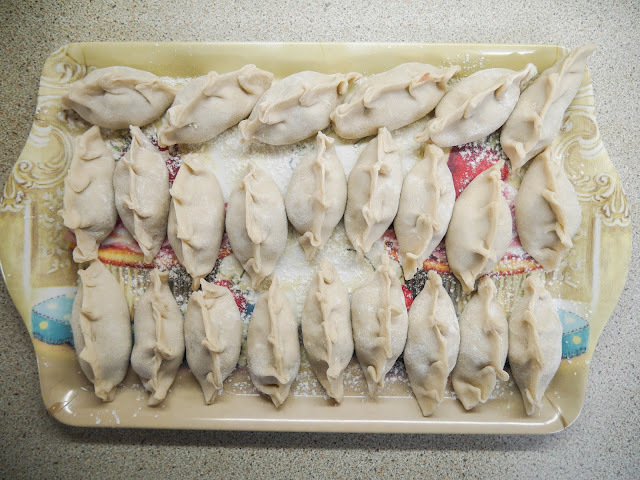 Keep the dumplings on a floured tray to stop them from sticking. 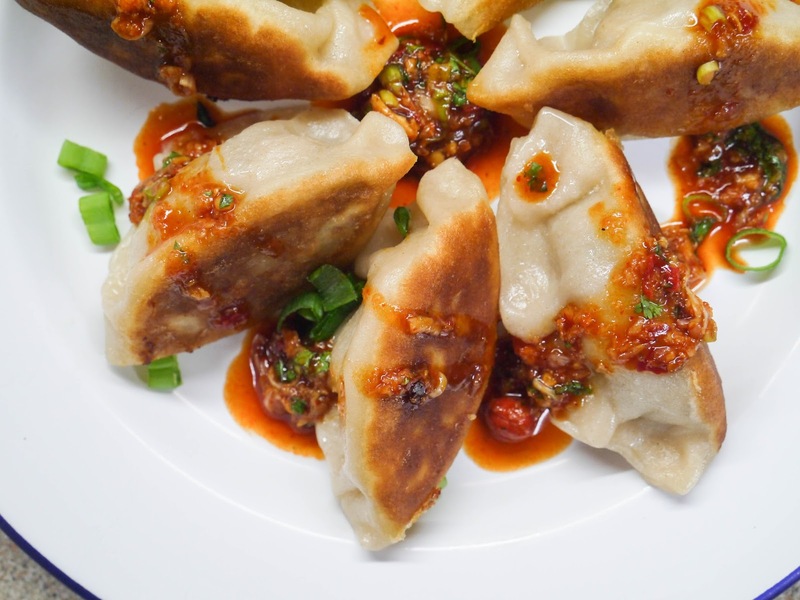 You could freeze the dumplings at this point too. For a simple dipping sauce, take 1 teaspoon of Toasted Sesame Oil. And, 1 teaspoon of Hot Chilli Sauce. To cook the dumplings, heat up a few teaspoons of Vegetable Oil in a frying pan. 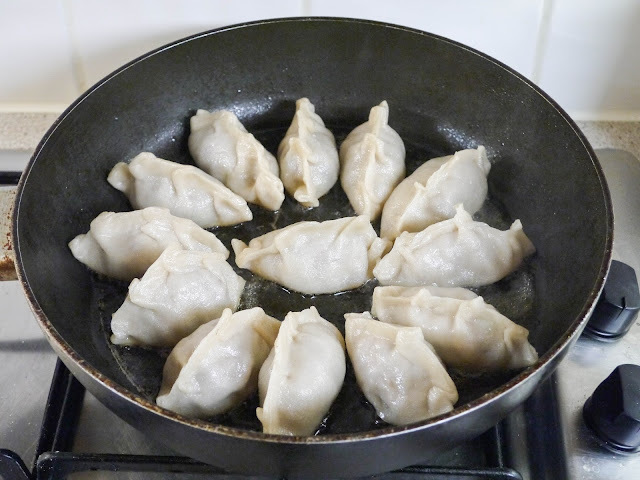 Once the oil is hot, add as many dumplings as can fit in the pan. Put them so that their bottoms are in the hot oil. 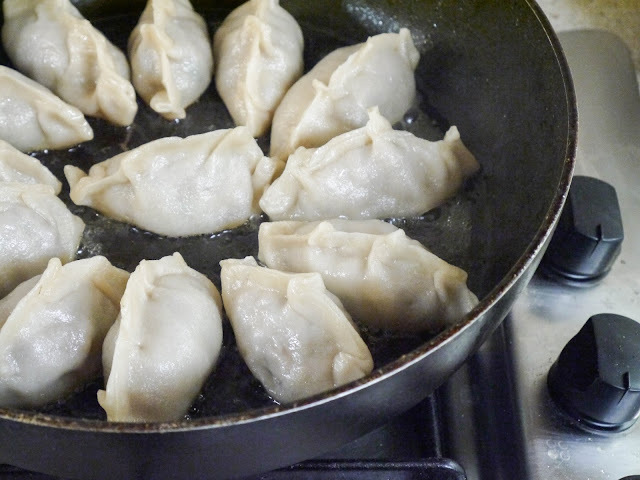 Fry the dumplings for a few minutes until the bottoms are golden brown. Lift one up to check! 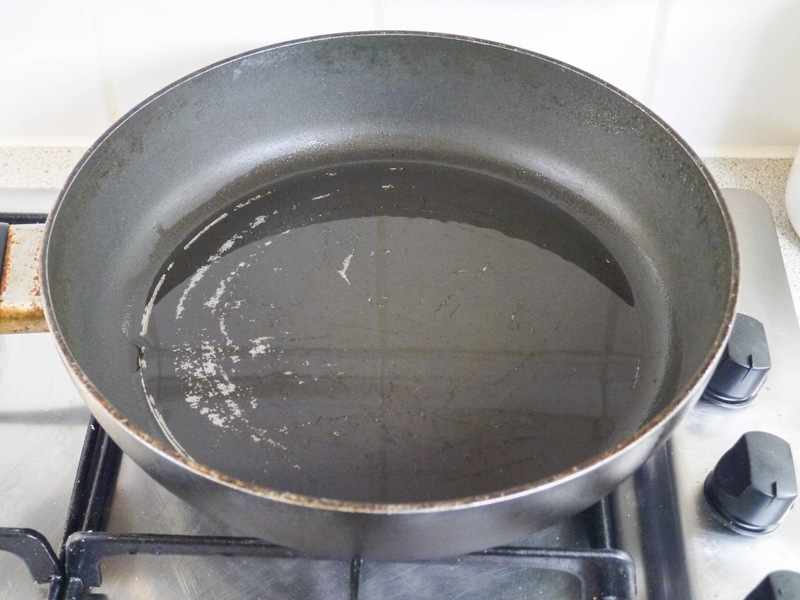 Then, turn the heat down and add 1/4 cup of Water. The pan will hiss so be careful. 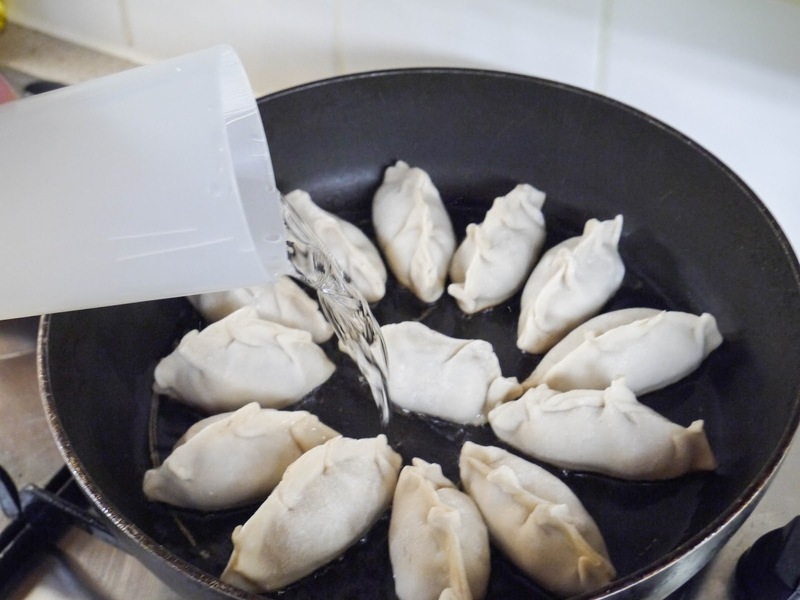 Immediately cover with a lid and let the dumplings steam for 8-10 minutes on a low heat. Uncover them and cook for another 3 minutes on a higher heat until any extra water has dried out. Once the dumplings are translucent, they're done! 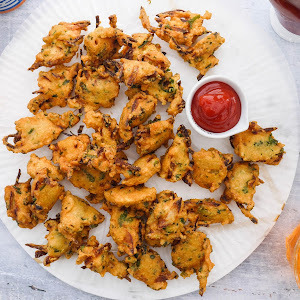 Serve them straight away with the dipping sauce! 1. First, make the dough. Place the flour, boiling water and salt into a bowl, and mix. When the dough becomes a rough ball, knead for 10 minutes on a surface until smooth. 2. Divide the dough into two equal-sized pieces. Use your thumb to make a hole in the middle of each piece (like a bagel). Stretch out to a bagel sized shape with an even thickness all around. 3. Cover with cling-film and leave to rest for 20 minutes. 4. While the dough rests, make the filling. Mix all the filling ingredients together, and set aside. 5. Lightly flour a surface. Divide each dough piece into 16 equal sized pieces. 6. Lightly toss in plain flour. Take a piece of dough, and flatten with your palm. Roll into a thin disc which should be roughly 8cm in diameter. Brush a little water on the edges. 7. 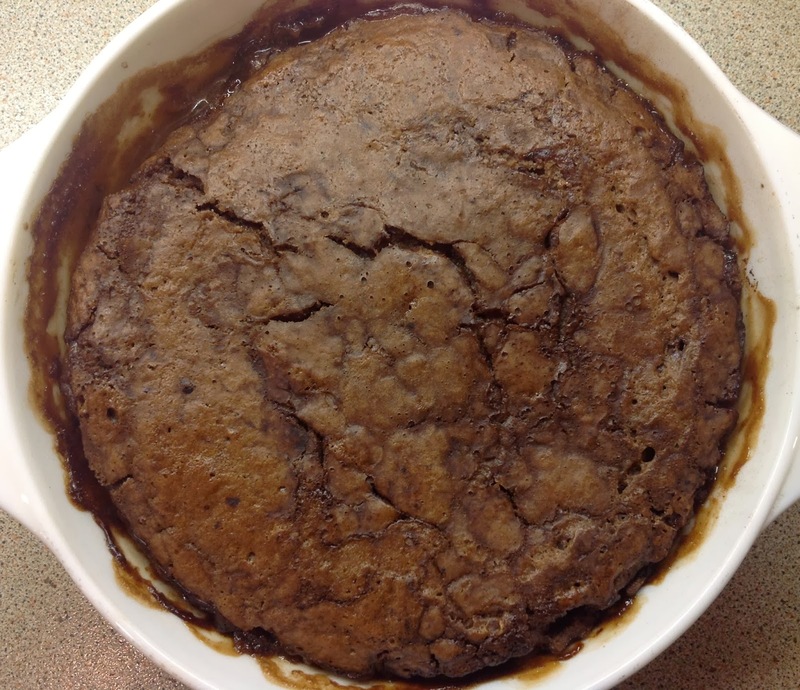 Place a heaped teaspoon of the filling in the middle of the circle. Fold over into a half moon shape, and crimp the sides to create a crescent moon shape. 9. Then, add ¼ cup water. 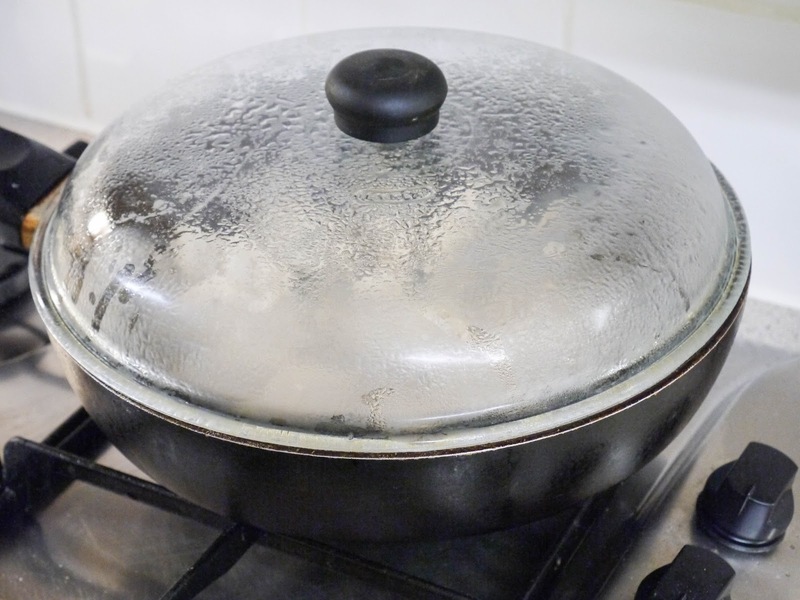 Cover and turn the heat to the lowest and let them steam for 8 minutes. 10. Uncover and allow to cook for another 3 minutes. 11. To make the simple dipping sauce, mix all the ingredients together. 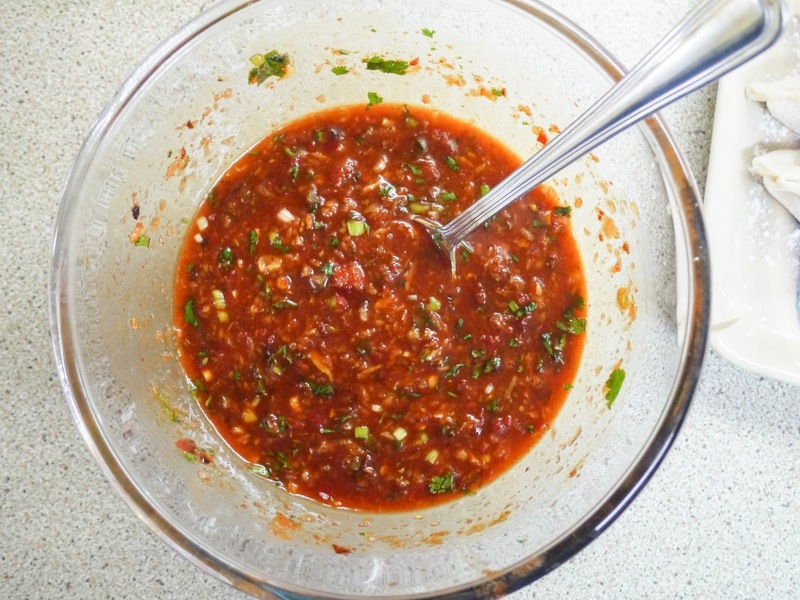 To make the spicy dipping sauce, mix all the ingredients together. 12. 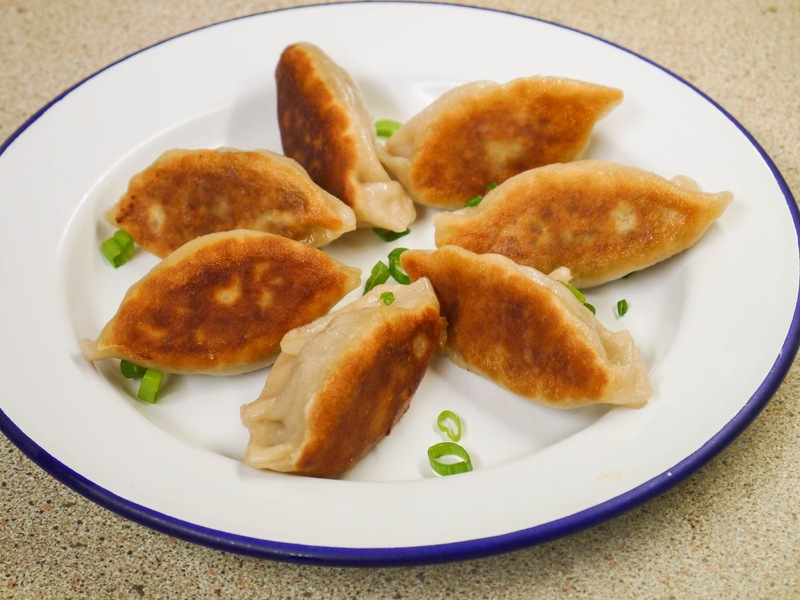 Serve the dumplings straight away with the dipping sauce! very clearly explained. 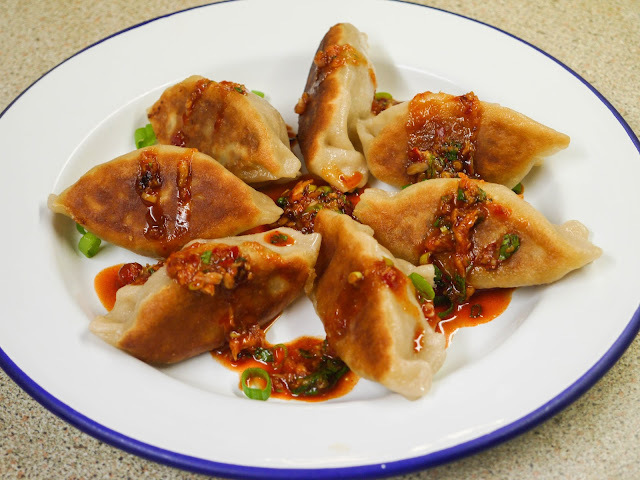 and yummy dumplings. 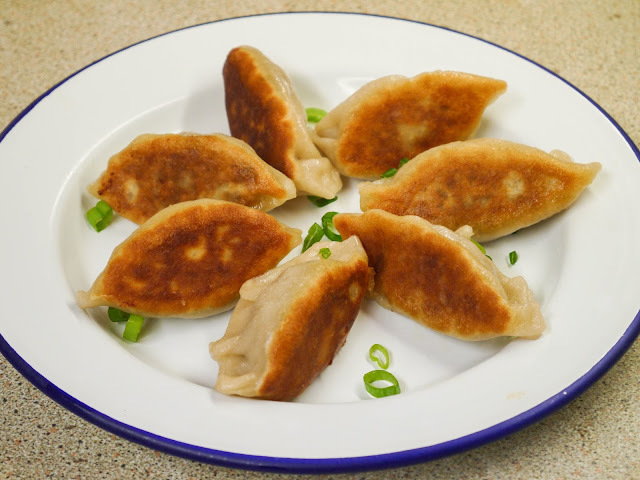 I tried your recipe and the dumplings turned out sooo delicious. It is a bit time consuming to make, but worth the effort. Even my 8 year old liked them! The red dipping sauce is heaven. I made this for the first time yesterday and they were soo yummy!! They will definitely become a regular staple within our house! 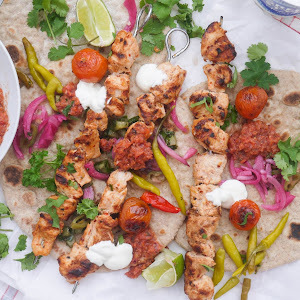 Also just a note - I used the printed out version of the recipe but it doesn't include the new dipping sauce that's mentioned in the step by step instructions, is it possible to update perhaps? So glad you enjoyed the dumplings! Yes, will update the recipe with the new sauce.